Though the pictures don’t move, the manuscripts look like they could have come straight out of the Hogwarts library. Which is exactly the point. 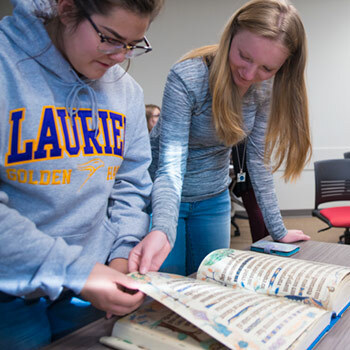 The students gathered at the Wilfrid Laurier University Library are in a tutorial for “Harry Potter and Medieval Culture,” a popular first-year class offered by the Department of Medieval and Medievalism Studies. Today, they are examining a number of medieval manuscripts from the Laurier Archives, some of them originals. “You’re in Diagon Alley,” Slytherin-garbed instructional assistant Rebekah Timm tells the students – many of whom look as enchanted by the manuscripts as they would be if they were in the fictional wizarding shopping street. 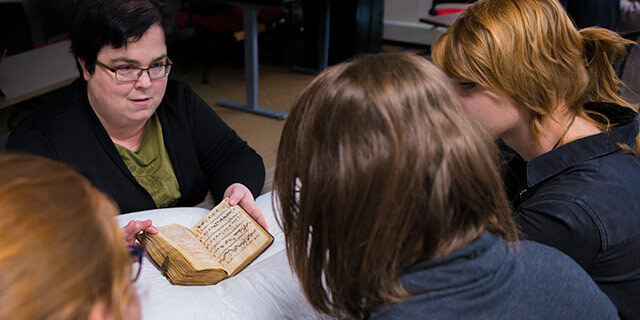 The Harry Potter books by J.K. Rowling and their film adaptations are medievalist, which means they are strongly influenced by medieval culture, says Alicia McKenzie (pictured below), the course instructor, who last year won a Laurier award for teaching excellence. The course was first developed a few years ago at the 300 level by Renée Ward, now at the University of Lincoln in the United Kingdom. It has since been adapted for first-years, with about 175 students enrolled this year. While certainly it attracts students who love the books they grew up with – the series of novels is 20 years old this year – Harry Potter is more than a hook to get registrations for a medieval studies class, says McKenzie. Rowling drew heavily on medieval culture and history when creating the Harry Potter universe, as did the filmmakers who adapted the books, says McKenzie. Some of these influences are more obvious than others. The Hogwarts School of Witchcraft and Wizardry certainly looks like and in many ways functions as a medieval castle. Architecturally it is “a mishmash of different types of medieval architecture,” says McKenzie. The Battle of Hogwarts often parallels real sieges of medieval castles, she adds. Medieval universities also influenced the fictional development of the school. A number of the movie scenes were shot at the University of Oxford, which dates to the 11th century. Oxford and its rival, the University of Cambridge, divided students into colleges, somewhat akin to Hogwarts “houses,” and mandated the wearing of academic robes similar to those at Hogwarts. Medieval university students also played violent games with high potential for injury – though unlike Hogwarts quidditch players, they didn’t do it on broomsticks. It’s also noteworthy that Rowling’s students write with quills on scrolls of parchment, says McKenzie. Somewhat less obvious influences shine through in the Triwizard Tournament, which draws from medieval tournaments and concepts such as knighthood and chivalry. The Harry Potter story in general has parallels with medieval hagiographies – accounts of the lives of saints, says McKenzie. Rowling’s “fantastic beasts” draw heavily upon medieval bestiaries, which were illustrated descriptions of real and imaginary beasts. The Fantastic Beasts and Where to Find Them companion book not only invokes creatures of medieval legend but also parallels the format of these bestiaries, says McKenzie. Also, Nicholas Flamel, who creates the Philosopher’s Stone in the Harry Potter books, was a real historical figure. However, the not-so-magical reality was that Flamel was a copier and seller of books who derived his fortune largely from marrying rich and speculating on property. The legend that he was an alchemist who turned lead into gold and brewed himself eternal life was a fiction that arose in the early modern period, well after his death, says McKenzie. Having a special tutorial session using materials from the Laurier Archives has been part of the Harry Potter course since the early days. 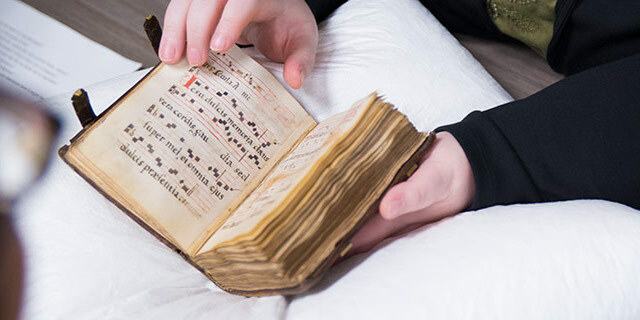 It’s a chance for students to get close to the medieval manuscripts, both originals and facsimiles, housed there. The tutorials are also a chance for the instructional assistants to come to the fore. The eight tutorial sections are all led by fourth-year students in the course ML402: Teaching, Learning and Thinking Through Medieval Studies.